I hope you enjoy exploring here. Relax....take your time......lots to see. Click on 'galleries' in the menu bar above to see photos arranged into groups. Choose your interest or category. 'Portfolio' are my own favorites. Clicking on a photo enlarges it for a much better view and will give more info. The site will view easily on any mobile device but best views are on a wide screen monitor. If you'd like more information or start a conversation about photography, use my contact information in the menu bar. Will be happy to hear from a visitor. I have posted a new photo essay, "April 2017 in Eastern, NC" Find it in the gallery tab above. While traveling up to Ocracoke, I found myself avoiding 'tourist' shots on the way and got home with a good collection of rural, coastal, scenic shots including a number of indigenous local built work boats. My one nod to the tourist shot is the iconic Ocracoke Lighthouse from 1893. "Sailing" has a well developed pic of a Herreschoff 14 (same as Buzzard's Bay 12.5) and "All the rest" has a new photo of "Fontana Lodge"
All of the photos are free to view but not to download. If you would like a print or digital copy you may choose the buy option on any photo or gallery. This is the current featured photo. It changes from time to time and comments on it will be provided. In the gallery "April 2017 Eastern NC" Click on it to locate and enlarge it. 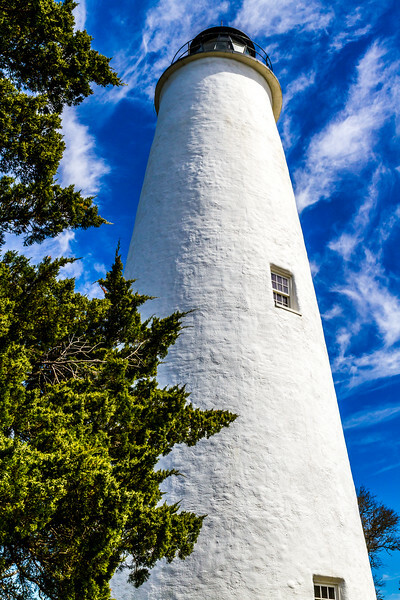 "Ocracoke Light 1823" was shot on April 9, 2017, in Ocracoke facing generally North at about 11 a.m. The rest of this gallery exhibits lots of scenic shots there and along the route. Shot with Canon 7D and Tamron 24-70mm lens. ISO 200, lens at 24 mm (equivalent to 38mm in 35mm format). f/11 to max out depth of field with shutter at 1/800 sec, hand held and no flash. Lightroom 6 effects: Careful balance of white/black points and high lights and shadows. Simple color enhancements with contrast added to bring clouds out bright and reduce haze. Please click it to enlarge.